01. Recorded by Roberto Mallo at Luis Seoane Foundation, A Coruña. A live recording from November 2008. I’ve been terribly remiss in keeping up with Malfatti’s work the last few years but from what I gather (there’s some good discussion in this IHM thread, this is a relatively rare recent example of his improvisatory work. That same thread has arguments pro and con the ambient noise that’s very present here as well as the somewhat rough recording quality, neither of which bothers me in any way. Malfatti, as is often the case, blows long, softly burred tones on his trombone, spacing them out over irregular intervals, allowing substantial time to elapse between exhalations. Unami excites small items via computer (or directly? ), causing buzzes, rattles, (hand-claps!) etc., also in a periodic manner. In his case, one sometimes can’t quite tell which sounds are his, which are the room’s. Again, no real matter. The piece flows beautifully. Unlike the Skrobek, there is a sense of a pool, of gentle ripples and floating objects jostling one another; everything is “there”, it’s just a question of what wafts into audible range at a given moment. I find it absolutely fascinating, serene, warm and stimulating. One of the best new releases I’ve heard in a while. 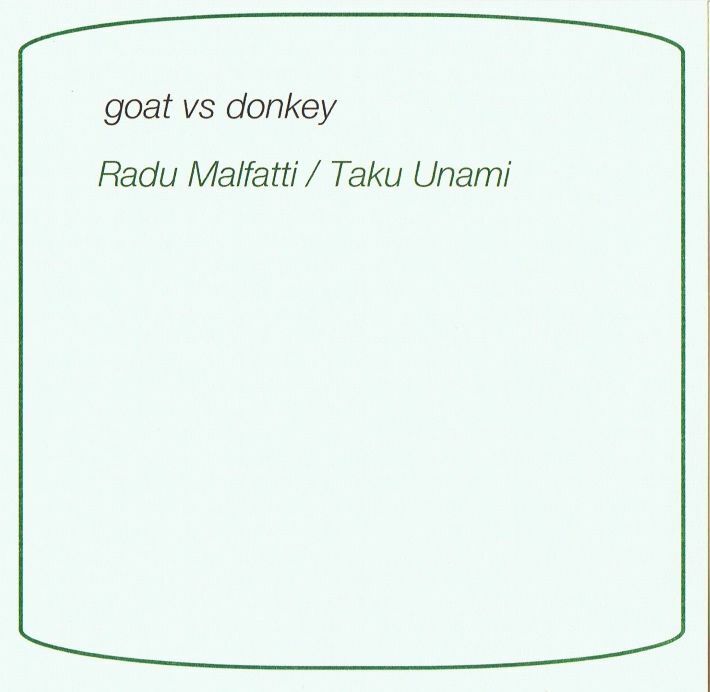 I do have one CD playing right now though, the most recent duo disc by Taku Unami and Radu Malfatti, this time entitled Goat vs Donkey and released as a CDr but also as a free download from the excellent Taumaturgia label. I need to go back and play the other recent release by this duo (Kushikushism on the Slub label) again before really comparing the two, but this new disc is sounding really very great indeed. The room plays its part on this release, plenty of audience shuffles and coughs can be heard alongside Unami’s rattling objects (almost distant here) and Malfatti’s brilliantly controlled soft tones. I’ve never heard this duo play in real life but badly want to. Unbelievably they will both be playing at the Instal Festival that I will be attending in just over a week but not together… how did that happen?! Goat vs Donkey is great though (regarding the title I wonder who is who? I think I know but will find out for sure next week 😉 ) I came home still buzzing a little from a crazy day but this has just calmed me down quickly. I’m not sure it is possible to do anything quickly or noisily while this music is playing. OK, so the large glass of exceptionally nice Alboriño that I have here is doing its bit to help as well, but still this music sounds good, strangely warm and welcoming music in many ways, despite its seemingly ascetic qualities. If anyone has stopped listening to Malfatti’s music in recent years because they feel alienated by the stark harshness of some of his compositions (I personally don’t find them harsh but many people seem to) then I thoroughly recommend grabbing this release. You can download it for free don’t forget. Radu Malfatti and Taku Unami, who aren’t credited here, but no doubt its analogue synth for Unami and trombone for Malfatti. They are ‘stars’ of the quiet scene, making sound when necessary and are silent when needed. This here is a recording from November 2008 in Spain, it seems, and its a powerful piece, in all its silenceness. Sounds arrive from nowhere and go to nowhere, and form small independent blocks of music. Sometimes independent of each other and sometimes as a duo. Definitely not easy music, but one that demands a lot of attention. Perhaps a bit less than when heard in concert, but when played at a medium volume – which I think is best for this kind of music to let the silence works best – its beautiful, and slowly unfolding. This 47-minute track was recorded live at the Fundación Luis Seoane in Corunna, Spain, on November 28th last year. I mention this because, in addition to Radu Malfatti’s velvety, attack-free trombone and Unami’s laptop whirls, the ambient noise from the performance space is also very much part and parcel of the listening experience, which is best appreciated by playing the disc at considerable volume. One has to put up with a few ugly coughs and grunts, but the sound of people coming and going, the distant rumble of the central heating system and the occasional creaks of tables and chairs blend rather well with the music. I read elsewhere in online discussions that much of this furniture noise actually came from Unami himself, which raises once more the question of where to draw the line between music and noise (or if there should be one at all) – is he “playing” the table or just “making a noise” with it? And would a Malfatti / Unami cough be more “acceptable” than one made by an audience member? Unami here restricts himself to gentle flutters, thankfully doing without the ticking polyrhythms that featured rather too prominently in his recent duo with Keith Rowe, but the music is not without tension, even drama – going up to the 16-minute mark Unami pushes the volume up to a deafening mezzoforte (! ), and Malfatti responds with what can only be described as a melody, a gorgeous three-note phrase consisting of a rising major sixth and a semitone. A few years ago, Radu Malfatti told me, with a typically wicked grin, that he thought 33’20” – the duration of both die temperatur der bedeutung and das profil des schweigens on his 1997 Timescraper disc – was ideal for his music, and I think he had a point. After the half-hour mark, the concentration starts to flag somewhat (mine? the performers’?) – another slight rise in intensity at 31′ seems to go over the same ground (clearly someone in the audience thought that too, as you can hear them making for the exit just afterwards). You might argue that Malfatti’s been going over the same ground for the past decade, and even accuse him of the stagnation he criticised in his interview with me back in 2001, but I don’t have a problem with that, and nor, it would seem, do any of the musicians who dream of making music with him. The only problem I have with this disc is trying to decide who’s the goat and who’s the donkey. So this is pretty quiet, right? But played about 50 per cent louder than you would normally listen to a recording, there’s a lot to hear on this live set from Malfatti and Unami at the Luis Seoane Foundation in Corunna, Spain. The building has a nice reverb and some sound timbers (I use the word advisedly). Trying to pick Unami’s percussive contributions from the door wich features frequently throughout is genuinelly difficult. When your performance is unrelievedly quiet, the inevitable result is that the audience listens harder and hears – as John Cage proved in his fabled sojourn in the anechoic chamber – something. There’s allways something to hear when we listen. One of the most surprising moments in this album occurred last Wednesday when one of my children took a shower upstairs and I had to turn the stereo down to be sure of what I was in fact listening to. The mention of Cage brings up a fundamental difficulty with compositions or performances in which the sounds made are (in a senses) not the point. When the resulting work is analogous to something like Tony Conrad’s 1961 word score Piece (‘to perform this piece, do not perform this piece’) – I’m left with the impression that I’m watching an eight year old’s magic show. Very good, but haven’t I seen these tricks somewhere before? I’ll admit I’m fundamentally sceptical about this whole ‘Reductionist’ shtick. It’s not that there’s no occasion to play quietly, but quiet is a relative term and only makes sense to me when countered by sounds that are less quiet. And that’s why this album, in the final analysis, does work. Because Malfatti’s subsonic drones (perhaps on trombone), Unami’s distant locust swarms of electronics and percussive interjections, intended and unintended, plus the sound of the Foundation building, are enough to get me listening, thinking and responding. But only just.